Shortly after taking office, I put forward a plan to end the war in Iraq responsibly. Today, I'm pleased to report that -- thanks to the extraordinary service of our troops and civilians in Iraq -- our combat mission will end this month, and we will complete a substantial drawdown of our troops. 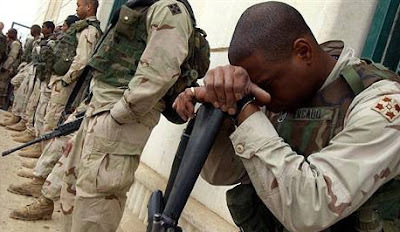 Over the last 18 months, over 90,000 U.S. troops have left Iraq. By the end of this month, 50,000 troops will be serving in Iraq. As Iraqi Security Forces take responsibility for securing their country, our troops will move to an advise-and-assist role. And, consistent with our agreement with the Iraqi government, all of our troops will be out of Iraq by the end of next year. Meanwhile, we will continue to build a strong partnership with the Iraqi people with an increased civilian commitment and diplomatic effort. A few weeks ago, men and women from one of the most deployed brigades in the U.S. Army, the 2nd Brigade Combat Team, 10th Mountain Division, returned home from Iraq. The Vice President and Dr. Jill Biden were at Fort Drum to welcome the veterans home and spoke about their personal experiences as a military family:Our commitment to our troops doesn't end once they come home -- it's only the beginning. Part of ending a war responsibly is meeting our responsibility to the men and women who have fought it. Our troops and their families have made tremendous sacrifices to keep our nation safe and secure, and as a nation we have a moral obligation to serve our veterans as well as they have served us. That's why we're building a 21st century Department of Veterans Affairs. We've made one of the largest percentage increase in the VA’s budget in 30 years, and we're dramatically increasing funding for veterans' health across the board. In particular, we're delivering unprecedented resources to treat signature wounds of today's wars—Traumatic Brain Injury and Post-Traumatic Stress Disorder. Our sacred trust to take care of our veterans goes beyond simply healing the wounds incurred in battle. We must ensure that when our veterans leave the Armed Forces, they have the opportunities they need to further their education and support their families. Through the Post-9/11 GI Bill, some 300,000 veterans and families members have pursued a college degree. Others are taking advantage of job training and placement programs. My Administration will continue to do our part to support the brave men and women in uniform that have sacrificed so much. But supporting our troops and their families is not just the job of the Federal Government; it's the responsibility of all Americans. As we mark this milestone in the Iraq war and our troops continue to move out of Iraq, I hope you'll join me in thanking them, and all of our troops and military families, for their service. We SALUTE Our Heroic Soldiers.